I’m slowly making my way back after having my own baby this fall and wanted to offer a Mother’s Day Special! Mom’s love to show off their children and families and I don’t know a better way to do that than a photo session. Maybe it’s a first time mom or a mom that hasn’t had family pictures in a long time, either way a special session to celebrate family and mom is always the best gift. My Mother’s Day special is a standard 2 hour lifestyle photo session with me and a 5×5 art book with 20 images. I very rarely do discounts or specials so this is a pretty big deal! The art book that I’m including normally goes for 325.00. This Mother’s Day special is 400.00! This special can be purchased as a gift certificate up through Mother’s Day. Sessions must be scheduled before September. If you’ve already had a session with me in 2016 and would like to take advantage of the art book, get in touch and I’ll extend a special offer to you as well. Lets celebrate Mother’s Day in a big way this year. 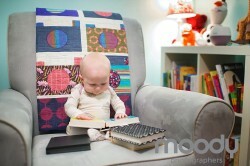 Here is my daughter Lena enjoying a few of our art books!